I must say that last night's Broadway Gala was extremely fun and definitely the least stressful Gala I have ever experienced. I think it was due in part to the fact that Belle Canto didn't have too many numbers so I wasn't doing rapid-fire costume changes in the wings of the stage and I actually had time to just hang out in the green room and watch the other performances. However, it did feel strange to be so idle when there was still so much backstage chaos going on. The first half of the evening were song selections revolving around the theme of "Family" from Seven Brides for Seven Brothers, The Sound of Music, Gypsy, Anne of Green Gables, White Christmas, and Cinderella and the second half were songs from The Fiddler on the Roof. I have to get it out now, I must say a special thanks for the amazing men's chorus this year! It's staggering to think that these men return year after year to help us out with the Broadway Gala given the amount of work they have to go through every year. They definitely had a lot of work in store for them this year with the male chorus demands in Seven Brides for Seven Brothers and Fiddler on the Roof. 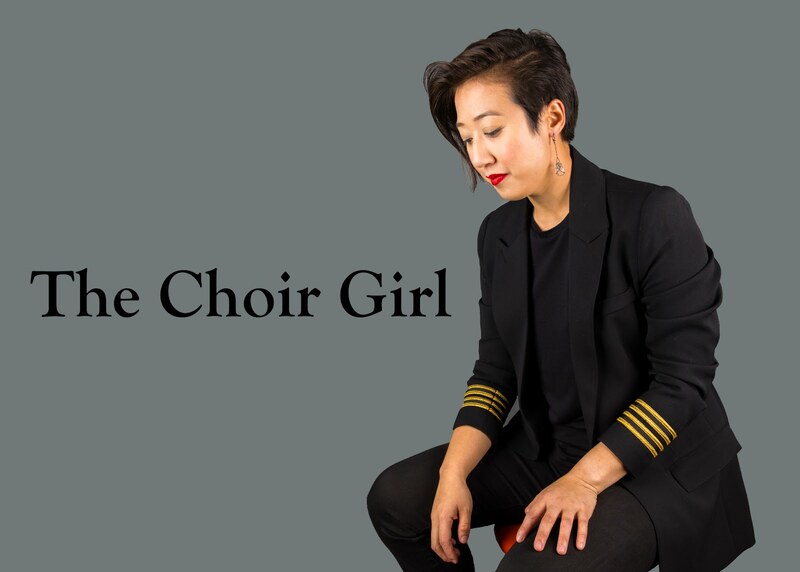 You may wonder how a treble-centric choral program manages to find men but it is all through the connections of our choristers. Fathers, husbands, brothers, friends, random strangers---these men comprise our male chorus. The only unfortunate thing this year was that Belle Canto and the Men's Chorus didn't have any duet numbers since I only have fond memories of knocking on coconut bras of the men from last year's South Pacific. I watched the first half of the concert from the Green Room t.v. so it was hard for me to hear exactly everything that was going on but it seemed like everything appeared to run smoothly. The "Goin' Courtin'" song from Seven Brides for Seven Brothers was extremely cute when 2 Belle Canto lasses were showing the proper courting ways for the socially unrefined brothers. There was a point where each of the men took turns two-stepping with the gals and it was hilarious to watch their purposefully off-beat dance steps as they tossed the ladies around. The numbers from Anne of Green Gables, Cinderella, and Gypsy were mainly small group or solo numbers and they all were carried off wonderfully from soloists from the choir. I do have to say, and I am not alone in this, that the highlight of the first half was definitely the songs from the Sound of Music and specifically the lovely little Mia, playing Gretel in "So Long, Farewell." The unphased little Mia sat in the middle of the stage all by herself and sang the solo line with confidence and charm. I watched from the backstage t.v. 's and my friend, Nicole, put it very well in saying that the performance was so gutwrenchingly cute that her ovaries felt it. The second half with Fiddler on the Roof brought all the choirs on stage for the mass numbers, and I must admit, I was winging it for a few of the pieces. Due to the fact that I was in Montreal for most of the week and missed out on 3 of the large rehearsals, I was definitely lagging behind in choreography precision. I knew my steps for the solo Belle Canto numbers such as for "Sister's" and "The Dream" from Fiddler but everything else was new to me. I appreciated the help of my fellow choristers tweaking my movements in Fiddler during the dress rehearsal (which was right before the performance) and I just watched others for the cues in Sabbath Prayer, Anatevka, and Sunrise Sunset. 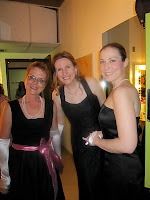 Also, thanks to Amy from Belle Canto for gathering up some Belle's to run through "Sisters" with me backstage. Enjoy some of the pictures from the evening! My dress for the sisters number. 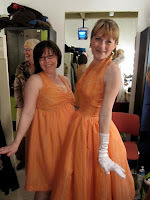 I originally brought a black dress (since I wasn't sure on what the costume verdit was as I kept on getting continuous e-mails from people changing their mind while I was away in Montreal) but I noticed that lots of people had color dresses on during the dress rehearsal. Due to the fact that our choreographer, Adam, said he was more focused on looking at people's dresses, I figured another black dress wasn't the most stimulating so I called my mom to bring this dress that has been sitting in my closet for a while. Sometimes I feel sorry for my pretty clothing pieces that never get to be worn so I'm glad this dress was able to have a night out. I believed it all worked out well and you can probably tell from the first photo in this post that the color pops a lot better than black. Belles classy in black for our sisters numbers.